Burqas or veil are a common sight among most of the Muslim communities around the world. The black veil is used to cover a woman’s hair or face but have you ever heard or seen women masks being used for the same purpose? 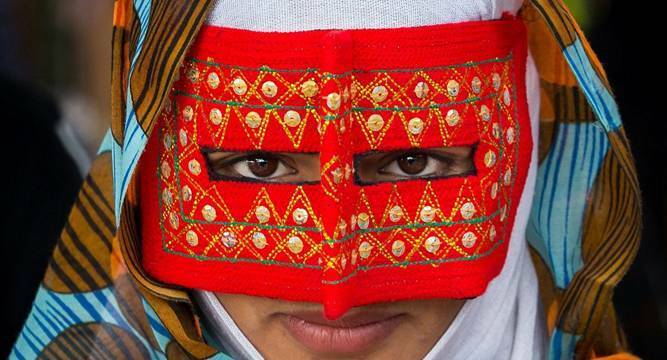 In Southern Iran, wearing boregheh masks is a common practice for girls as young as nine, they shield their eyes in colourful masks that rely on years of tradition for their distinctive look. Photographer Eric Lafforgue has captured the beautiful Boregeh masks in different gold, red, embroidered and sequined designs worn in Southern Iran, for centuries by the Bandari people, the Arab Iranians who live in the coastal region. The stunning headpieces are designed according to the ancestral tradition and are first worn at social events or gatherings by children before they attain puberty. As the masks are always made to measure, it take two days to create one mask. The two holes for the eyes must perfectly fit the eyes so they don’t cause blurred vision. The main purpose if to cover the forehead and nose, the mouth is often hidden by adding a veil. The masks have practical and cultural purposes, it is believed that they help to shield skin against sunrays thus keeping it white. These beautiful masks are worn by both Shiite and Sunni Muslims. What differs their masks is Shiites tend to wear red rectangular masks, while Sunnis usually wear black or golden ones made with indigo cloth and less geometric shapes. Centuries ago, one of the masks called ‘Qeshm’ masks were designed to fool invaders, so they would mistake women for male soldiers. Masks are sold for the equivalent of €5.00 (£3.90) but they sell for more when they are exported to the United Arab Emirates where demand for boreghehs is strong. Sometimes, to add a touch of sparkle, the golden ornaments on the veils and masks are reserved for weddings. Wearing these ornaments masks is also a sign of wealth or good financial health among them. However, the practice is dying out as more and more women are coming out in support of veil less public visits. It's also becoming less common for young people on Qeshm Island to wear the masks that cover most of their faces and it's mainly a tradition among older Bandari women. Earlier women used to embroider the masks by hand but with time sewing machines have taken over. The golden ornaments on the veils and masks add a touch of sparkle during ceremonies. They also signify good financial health for anyone who wears such an ornate mask in everyday life. It's mainly a tradition among older Bandari women. It's becoming less common for young people on Qeshm Island. The mask in no way prevents women from enjoying a social life or speaking to men as happens in a strict regime such as Saudi Arabia. The orange mask is for the fiancée and often small gold decorations are added to the cords that attach it to the head. Red is worn by married women.